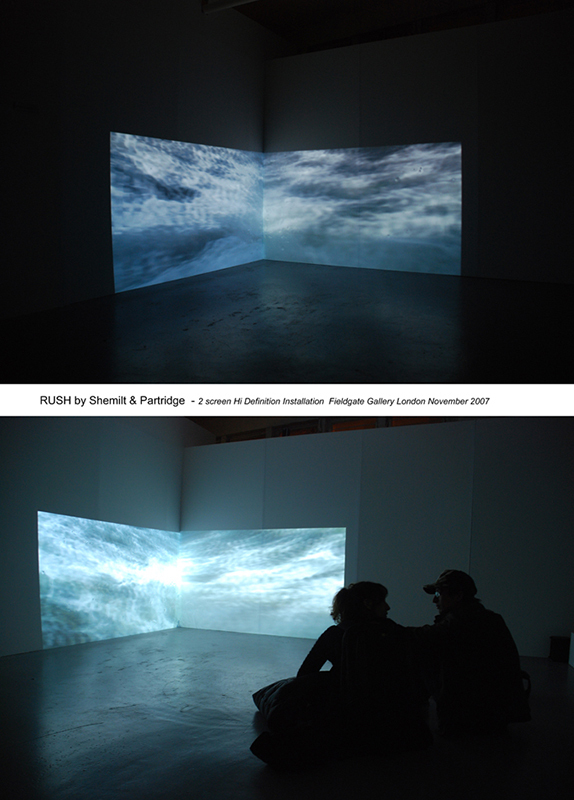 A joint work with Stephen Partridge, two channel hi-definition video projection. Exhibited in ANALOGUE a group exhibition curated by Chris Meigh Andrews at the Fieldgate Gallery, London, 24 November – 16 December 2007. This high definition (1920×1080 pixels) video work was based on footage shot from the Glen Masson off the coast of Ayrshire and along the nautical measured mile. Artists were invited by Richard Demarco to produce works from cruises aboard the vessel., the artists’ cruises sponsored by Majestic Lines. Rush deals with very fast moving data, faster than the charged coupled devices in the camera, and subsequently faster than the computer codecs can comfortably resolve in post production and display. In addition, spray occasionally forms water droplets and ‘pours’ down the screen, disturbing the illusion, and referencing the artifice of the cinema screen surface. The work is installed into a 90-degree corner of the gallery, kissing the floor, which reflects the two screens. There is also a stereo soundtrack of artificial though related sound effects, re-enforcing the rapid pace of the movement.